Enzo LoRe had the silly idea he was going into semi-retirement when he and his family moved down from New York. Wife Josephine (that's her, with the pretty smile) had a different idea. 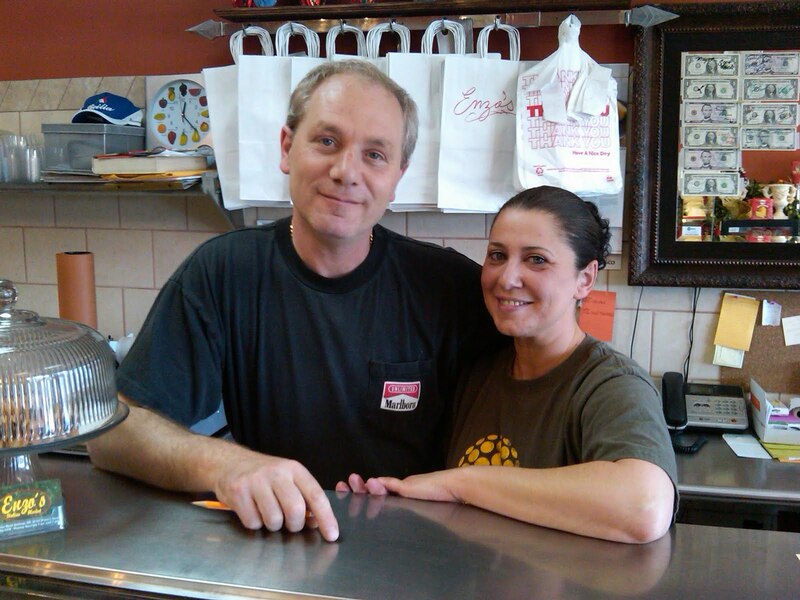 They opened an Italian meat shop in Stallings, outside Matthews, three months ago and now they're both working hard. Small world: Both Josephine and Enzo were born in Sicily, but they met in New York. She moved here at age 5, he moved here when he was 11 or 12. Even smaller world: When Enzo had a meat shop in New York, one of the distributors he worked with was Tony Stafford, who now owns Ferrucci's, the popular Italian market in Cornelius. OK, so to the food: Some Italian products and pastries (cannoli, of course) but mostly a long case full of braciole, skirt steak, housemade Italian sausages in a half-dozen or so flavors, prepared dishes like the "Parms" -- eggplant and chicken -- lasagnes and more. When I stopped by Thursday, the wonderful smell turned out to be rice balls being fried up in the back. Between Enzo's, Ferrucci's, Pasta & Provisions and Derados, another new market in Cornelius, our Italian shopping list is getting filled. I am a regular shopper at Enzo's and can not say enough great things about the quality of their product, or the quality of the people behind the counter. Worth the drive, and worth the exercise it will take to wear off their amazing goods! Enzo's turned out to be a little bit of Italy in south charlotte, The Rice Ball was fantastic..the eggplant parm , incredible and the tiramisu!! Bellisimo! You have to come and see it..It has a full service meat market too! Just stopped by there & got the meatballs with sauce. Excellent.